DVD stands for Digital Versatile Disc and DVD+R is a recordable version of the DVD optical disc. DVD+R was developed by Philips and Sony in the late 90's. DVD+R is still a popular format for DVD Recordable. DVD+R is believed to have slightly better compatability with DVD players that have been purchased by users over the past 7 years. If you are new to DVD recording you will want to know the format that your DVD recorder will accept, DVD-R or DVD+R or both. You will need to purchase the proper format for your recorder. You will also want to know what speed your recorder is. If you have a 16x drive you will be able to record a DVD anywhere from 1x to 16x. You can purchase 16x media and reap the benefits of faster recording. You can also purchase 8x or 4x media that will work just fine in your 16x drive even though it will not burn at 16x. If you have a 4x DVD recorder and you purchase 16x media it will not burn faster than 4x. The record speed of your DVD recorder is the maximum speed that you can record. All consumer or standalone DVD recorders are "real time" and therefore burn at 1x. 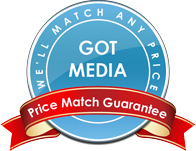 This does not mean that you have to purchase 1x media. You can use any speed media as long as the format is compatible with your recorder DVD-R or DVD+R. Brand is probably the most important thing to consider when you are shopping for a blank DVD+R. A quality brand will almost always be the best choice for any application whether it be archiving, master recording, duplicating or just burning a DVD to watch on your TV. Quality brands are made to perform better, last longer and have the most universal compatibility across various DVD players. If you want your burned DVD to play in 95+% of DVD players that exist then you should stick with brands known for quality. Verbatim, Taiyo Yuden have been known to produce the highest quality DVD+R media. Ridata is also a very good manufacturer.